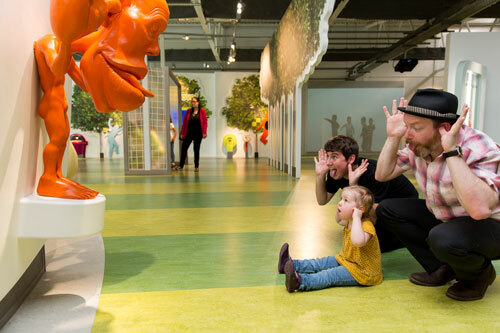 Eureka!’s Access All Areas project set out to bring more disabled children and their families to the children’s museum. Staff at the Halifax-based museum found that disabled children were often excluded from days out, simply because of poor physical access into a building or lack of support once there. The struggle to access theatre, arts, museums and leisure facilities within local communities was something Eureka! wanted to change. After connecting with local disability groups, the museum secured funding from the Esmee Fairbairn Foundation for a three-year initiative to offer accessible activities and bespoke services. Throughout the process, Eureka! would experience fundamental organisational change and focused heavily on staff development. A total of 250 staff were trained up on different aspects of disability awareness and that process has now become an automatic part of the induction process for new staff. Some 38 staff were trained in autism awareness; 15 became front-of-house sign language experts, 18 completed signed singing training, 12 were educated to deliver sensory story sessions and eight completed training in adapting activities for deaf children. The museum engaged with 500 families during the process. An ‘extra pair of hands’ service was made available and remains a service offered to visitors on request. New posts were opened up including a permanent inclusion manager and a specialist Access All Areas enabler. The combined result was a 45 per cent increase in visits from families with a disabled child. Visit England awarded the programme a gold Access for All award in 2015. The programme’s success encouraged the museum to share its new knowledge far and wide, hosting a conference in 2014 to raise awareness about the barriers that families with a disabled child face in accessing family days out. Over 80 delegates attended, reporting that they were “inspired” to carry it further and reporting the initiative as a “major catalyst for change”. Charity Awards judge Samantha Sparrow, director of Task Squad at vinspired, said the project “demonstrated strong evidence against most of the hallmarks of excellence”. Chair of the Charity Awards judging panel Andrew Hind said Eureka! “successfully incubated a whole new mindset throughout the whole organisation”.